iOS SOS: mobile users need your help! As more of our students are using devices such as iPads and iPhones – which do not have Microsoft packages installed – we need to change the way we save items in eShare so that students can view them whichever device they are using. PDF is the way forward! There’s a simple solution – save your document as a PDF, then upload it to eShare. If you already have a document saved in eShare in a Microsoft package such as Word follow these step-by-step instructions to swap the document without losing the URL. 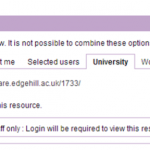 Remember, if you want students to access documents, you must set the Viewing Permissions to ‘University’ or ‘World’. If you have any queries regarding eShare or would like to arrange a group or 1:1 training session please contact eshare@edgehill.ac.uk. Come along on Wednesday 16th January for an introduction to our digital repository for teaching and learning and see how you can make the most of eShare. Wednesday 16th January 1.00pm-3.00pm book online here. The next session in the Emerging Technologies staff development series will be an overview of using audio and video with your students. It will run on Wednesday 7th December between 1 and 2pm and you can book on the staff development pages. The aim of the session is to help you think through what is possible, and what the benefits and challenges might be. We won’t have time to talk about all the technical details in the session, but will be able to provide more specific support and guidance after the session.